AV Recorder & Screen Capture 2.0.1 – Easy-to-use screen capture and audio, video recording tool. AV Recorder & Screen Capture – The best quality and easy-to-use screen capture and audio, video recording tool. Have the ability to record voice from mic & system audio at the same time. The app is perfect for creating tutorials, lectures, game playing and recording on your Mac. Also you can instantly share the recording video to Youtube. ● Capture everything and anything on your screen. ● Max resolution 2880-by-1800 for recording video. ● Perfect FPS for your playing game and HD video recording. 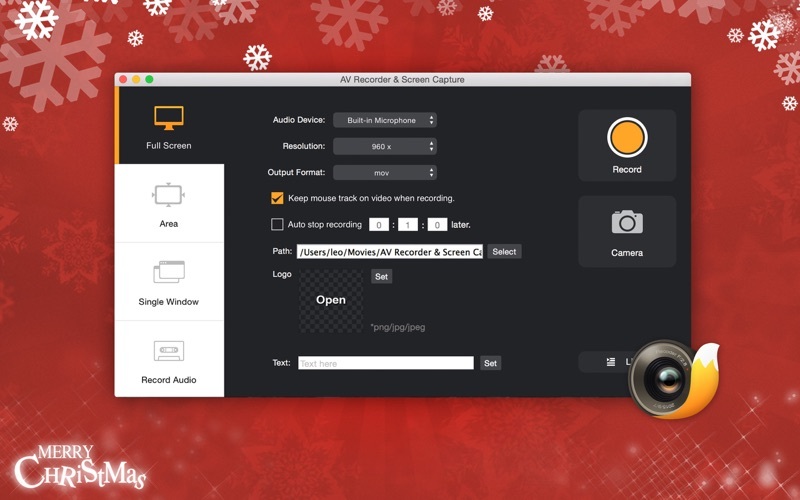 ● Record your desktop in full-screen, in portions, fix window. ● Record system audio and microphone at the same time for your recording video (mov, mp4, m4v) /audio. ● Support to export the recording audio to mp3,mp4, m4r, caf, m4a. ● Record video at any size with no time limitations. ● Support customized optimum image/text logo on recording video. ● Auto stop recording in fix time. ● Trim the recoding video. ● Share the recording video to your friends online. Add restore function on main menu. Change the recording file name with same format. Next story Music Binder Pro 3.5 – Music sheets organizer and iTunes player. Previous story Nimble Commander Pro 1.2.3 – Minimalist dual-pane file manager (was Files Pro). AV Recorder & Screen Capture 2.2.0 – Easy-to-use screen capture and audio, video recording tool. Capturer 1.0.4 – Automated screen captures. Sharpshooter 2.2b1 – Manage your screenshots with this renaming utility (beta).